Enrollment for the 2019 ATS Mentoring Program is now CLOSED. ATS Assembly Mentoring Programs offer valuable advice and wisdom at critical points in a member's career development. Designed to foster formal facilitated mentoring connections to help mentees grow and advance their careers, the programs provide support through individualized attention. A commitment is required to provide a nurturing environment for mentees, and create the best available opportunities to succeed throughout their training. A structure is followed, outlining expectations for both the mentor and mentee. Mentees and mentors have the opportunity to meet face-to-face during the ATS International Conference at the Mentoring Program Spot. Mentees and mentors taking advantage of these meetings will be able to collaborate, discuss career strategies, and plan conference schedules. Currently, all fourteen ATS assemblies our offering mentoring programs. Click on the following links below to check out each assembly mentoring program's goals and expectations. The deadline for signing up was Friday, March 15th, 2019. Please note: Both mentee and mentor must be an ATS member. If you did not sign up for as assembly, you can do so at any time by visiting the ATS website, clicking on the members tab then selecting "Update Your Profile". Changes will update in the ATS database in one hour. Mentees can only sign up to one assembly whereas mentors can sign up to multiple assemblies. As an ATS member you can sign up as a mentee and mentor. 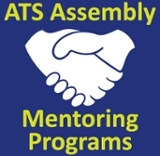 We look forward to your participation in the ATS Assembly Mentoring Programs! For more information contact Nicole Feijoo, Assembly Programs Coordinator.